No.. 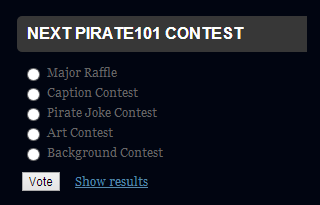 I'm not announcing a new Pirate101 Contest yet. I really wanted to ask all of ye for your vote on the next new type of contest I will have whatever the contest will be about. I don't know what contest I'm going to have next but I do know I want all of ye to vote for a contest ye think would be the best type of contest. How do ye vote? Vote by clicking on the vote option below the followers of this blog and above Follow By Email. Whatever vote gets the highest vote will be the next type of contest. If its a Raffle then all of the prizes will be included in the contest, if it's only a graphic contest I will include the 2nd most voted a part of the contest also.. It depends on how many codes I give out. Good luck and please vote! Thanks Autumn for helping me figure out a bunch of contests and giving everyone a chance to vote. If ye have any questions just comment below and I'll answer them. :) IF there's a contest announced before voting ends I'll just have another Rafflecopter giveaway. Decided not to have this contest. Sorry!